The grounds of the Central Arizona Project’s headquarters, on the northern edge of Phoenix, have the spareness of a Georgia O’Keeffe painting. The main building is finished in faux adobe, and the landscaping is very much in the Southwest-chic, heavy-on-the-cactus style. There isn’t a patch of grass in sight. But alongside the walkway that leads to the building’s entrance sits what looks like a part from an oversized jet engine: an 8-ton stainless-steel impeller that was yanked out of one of six giant pumps on the Colorado River and deposited as a sort of monument outside the CAP’s front doors. It’s the first hint of the big dam-era braggadocio that waits inside. On the far side of the building runs the CAP canal itself, a powerful, shimmering symbol of the conquest of the Colorado. The 80-foot-wide, 25-foot-deep canal carries 1.3 million gallons of river water per minute from the Colorado River, 160 miles away, to Phoenix, and then another 170-some-odd miles south to Tucson. It provides plentiful supplies to fuel the state’s chart-topping urban growth and serve as a hedge against drought, and it has become the weapon with which Arizona has been waging a sort of riverine Cold War. In his lushly appointed office, the CAP’s general manager, David S. "Sid" Wilson, reclines in a chair and takes a swig of water from a bottle with a "Central Arizona Project" label on it. He begins by declaiming, "I am a beneficiary of some long-range foresight on the part of people who were planning for the future of Arizona." His telling of the CAP legend begins with the flinty pioneers who first began farming the Salt River Valley in the 19th century. Then, he moves into the story of the Salt River Project, one of the federal Bureau of Reclamation’s first big dam programs, which harnessed the Salt and Verde rivers and allowed Phoenix to gain a foothold in the desert in the early 1900s. He relates how California preyed on Arizona’s water for nearly half a century, and emphasizes the story’s triumphant denouement in the 1960s, when Arizona’s political heavyweights won congressional approval for the CAP, in one of the last great political battles of the dam-building era. But there’s a side of this story that Sid Wilson tells with less gusto. If the CAP helped the desert bloom, the current drought may take the bloom off the rose. The water levels in Lake Mead and Lake Powell — the Colorado River’s drought-protection savings accounts — have been dropping since 1999. This winter’s storms have given some hope that the drought may be turning around; snowpack in the Colorado Basin is 111 percent of average for this time of year. But even if the drought is easing, recovery is still a long way off: The Bureau of Reclamation has said that it could take decades of average precipitation to refill Lake Powell. Federal officials have indicated that, if reservoir levels continue to drop, U.S. Secretary of the Interior Gale Norton could declare a formal shortage on the river as early as 2007, in order to ensure that states with higher-priority rights continue to receive water. Representatives of the seven Colorado River Basin states — Arizona, California, Nevada, Colorado, Utah, Wyoming and New Mexico — have been meeting to come up with a plan by April to reduce water use and stave off a formal shortage declaration. The stakes are particularly high for Arizona: The CAP, which has the worst water rights on the river, would be the first to see its spigot turned off (HCN, 1/24/05: A crisis brews on the Colorado). In the world outside Wilson’s office, the Arizona development boom continues. Crews in stucco-spattered work trucks finish off legions of new homes in the desert, and bulldozers clear the way for tens of thousands more. But behind the scenes at the CAP and Arizona’s other water outfits, the true dimensions of the water shortage are beginning to come into focus. The drought could overwhelm the state’s fitful efforts to achieve sustainability, and water managers are grappling with the growing realization that, despite a century’s worth of efforts to engineer water shortages out of existence, nature still bats last. 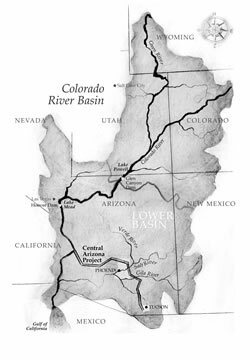 If there was a Moses moment on the Colorado River, it was in 1922, when the seven basin states parted its waters among themselves with the Colorado River Compact. Arizona, Sid Wilson says, wound up an underdog. 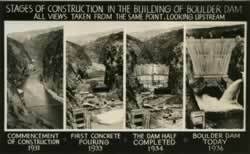 The compact cleared the way for the Bureau of Reclamation to begin building Hoover Dam and creating Lake Mead, which stored water that, at the time, was most needed in California. But Arizona refused to ratify the compact, and in 1931, the state sued California, claiming that, in effect, it was monopolizing the river’s water. The U.S. Supreme Court threw out the suit, but Arizona kept up the fight: In 1933, Arizona Gov. Benjamin Moeur even called out the state’s National Guard in an attempt to stop the construction of Parker Dam, where Los Angeles diverts water from the river. Although Arizona’s fightin’ approach didn’t work, the next decade brought a growing realization in the state that it needed more water from the river. In 1944, Arizona finally signed the Colorado River Compact as a prelude to asking Congress for federal funding to build the CAP, which would deliver roughly half of Arizona’s share of the river to farms and cities in the central part of the state. But even with the compact signed, it took more than two decades of politicking and legal fights to convince Congress to approve the Central Arizona Project. 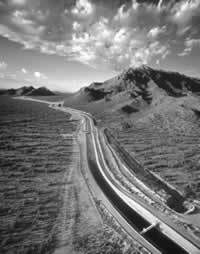 The project, finally started in 1973, would eventually require two more decades and $4 billion to build. The CAP signaled Arizona’s coming-of-age on the river, but it came with a catch: In the hierarchy of rights to the river’s water, the project sits at the very bottom. (The state’s other 1.3 million acre-feet of Colorado River water, which is primarily used for agriculture along the river itself, has a somewhat higher priority.) "In times of shortage," says Wilson, "Arizona could lose every drop of the 1.5 million acre-feet of CAP water before California lost the first bucket out of its 4.4 million acre-feet." To guard against that possibility, Arizona has salted away its unused supply of Colorado River water in underground "water banks." Aquifer recharge projects take water out of the CAP canal and spread it into man-made basins carved out of the desert. From there, the water percolates into the aquifers below. Since 1989, the state has deposited about 4 million acre-feet of water underground. But the water-banking tactic hasn’t won Arizona many friends among the other five Colorado River Basin states. They question why, six years into the most severe drought in memory, Arizona is still taking water that it doesn’t immediately need out of the Colorado River system — essentially transferring water into its own drought savings account while drawing down the reservoirs that serve as the collective account for all the Basin states. And the banking program hasn’t proven to have the legs that Arizona had hoped. "The problem is, we had a plan and we put together a 30-year program to recharge (ground)water," says the Mississippi-born Wilson, who habitually says "drouth" instead of "drought." "Well, the drouth came along after about 10 years." Grady Gammage Jr. is a prominent Phoenix attorney who left the Central Arizona Project’s board of directors in January after a 12-year stint. His law firm occupies the 18th floor of downtown Phoenix’s One Renaissance Square, and as an attorney whose clients include some of the city’s large developers, he gives a lot of thought to growth and water. Gammage is a longtime believer in the CAP, but he has recently concluded that the project has given his state a false sense of security. Before the construction of the CAP, Phoenix and its sister to the south, Tucson, relied mainly on groundwater. In the post-World War II growth boom, the two cities started pumping water from the ground far faster than the state’s meager rain and snowmelt could replace it. By the 1970s, Arizona was overdrafting its aquifers by about 2.2 million acre-feet a year, and some areas saw groundwater levels drop hundreds of feet below the surface. The state was mining the water out from under itself, and in some places on the west side of Phoenix, the earth slumped three feet. There are many different versions of what happened next; the simplest is that Cecil Andrus, President Carter’s secretary of the Interior, refused to ask Congress to fund the CAP unless Arizona promised to wean itself from mined, largely nonrenewable groundwater. Andrus didn’t want to feed the state’s addiction; instead, he wanted to help it find a more sustainable diet of surface water. By providing an alternative, renewable water supply, the CAP could help stanch the run on the aquifers. So in 1980, the state Legislature passed the Arizona Groundwater Management Act, arguably the most progressive groundwater-management policy in the country. The act required developers to prove they had a 100-year "assured supply" of renewable surface water before they could begin building. Phoenix, Tucson and Prescott were designated as "Active Management Areas" and given a goal of "safe yield" by 2025 — when the amount of water pumped out of the cities’ aquifers is supposed to be no more than is balanced through rain or artificial recharge. The safe-yield goal was a basic tenet of water sustainability, a sort of hydrologic equilibrium that balanced use with replenishment and helped preserve the groundwater for the future. "The notion of the act was that you shouldn’t continue to grow just based on groundwater — but it wasn’t that you should never use groundwater," says Gammage. "I think the concept all along was that groundwater was an insurance policy; it should only be used in times of need." But that concept has largely been lost, he says. Thanks to what amounts to a loophole in the law, more and more new development is being built atop groundwater. To accommodate new housing developments in areas where it wasn’t practical to pipe CAP water, the state Legislature in 1993 created the Central Arizona Groundwater Replenishment District. Developers could build subdivisions that could only be served by groundwater, but the homeowners would have to pay the groundwater replenishment district to find surface water and pump it back into the aquifers elsewhere. When the Legislature created the groundwater replenishment district, says Cliff Neal, the district’s manager, "The amount of excess CAP water was far in excess of anybody’s imagination as to what the groundwater replenishment district would need. (People thought the district) could just go out and pick up whatever’s on the market at the time." However, as Arizona’s population shot skyward, he says, "That theory kind of went out the window." The district now has obligations to find substitute water for 125,000 houses, primarily in the Phoenix area. That’s roughly three times as much as originally projected, and over the next 10 years, the district itself anticipates that its obligations could grow to 342,000 new houses. "It’s staggering," says Gammage. "It’s grown all out of everybody’s expectations." Because the district has no authority to deny service to new developments, some observers predict that enrollment could actually climb to more than 500,000 houses in the next decade. And the replenishment district is further overextended because even cities that do have access to river water have signed up with the groundwater district as well. "Rather than build systems to take direct delivery of CAP water and treat it, a lot of cities on the West Side (where growth is happening fastest) decided they’d just join the groundwater replenishment district," says Gammage. "The result of that is that a lot of the future growth of Phoenix is going to be using mined groundwater. That’s got everybody thinking, ‘Well, wait a minute: We had this goal of safe yield, and we’ve sort of gutted it by enacting the district.’ "
As a result of the groundwater replenishment loophole, combined with some continued groundwater use by farms and a drought on the Salt and Verde rivers that started in 1996, groundwater levels in the Active Management Areas are still going down, despite the massive infusion of CAP water. In 2002, the most recent year for which data are available, the Phoenix Active Management Area used approximately 200,000 more acre-feet of groundwater than it recharged, and the Department of Water Resources has stated that, even though the rate of the water-level’s decline will decrease, "all credible projections for the year 2025 indicate that we will still be in an overdraft situation." Until last year, the district planned to meet its replenishment obligations entirely with excess CAP water. However, the district’s new 10-year plan, completed last November, acknowledges that the rules of the game have changed: "It is clear that (the groundwater replenishment district) and other excess CAP water customer needs far outstrip the estimated excess CAP water supply." That was without even considering how the drought — or global warming — might reduce the amount of water available through the CAP. The legions of new, tile-roofed homes filling Phoenix and the surrounding Salt River Valley are signs of the record-breaking growth in the area. Massive expanses of desert are being bladed for new developments that contain thousands of homes. The city of Phoenix itself has about 1.4 million people. The entire Phoenix metropolitan area — which includes large suburbs like Tempe, Mesa and Scottsdale — has more than doubled in population since 1980, and is now home to about 3.5 million people. Until recently, newcomers were drawn by the area’s lower-than-average housing prices compared with other cities in the West. Now, rapidly increasing home values have driven another spate of home buying: As stock market returns have lost their luster, an increasing number of speculators have begun investing in Phoenix’s white-hot real estate market. The growth is showing no signs of slowing down. In 2003, the Phoenix metropolitan area issued around 48,000 permits for new homes, a record that most observers thought couldn’t be beat. 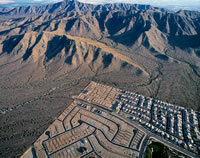 Then, in 2004, Phoenix promptly topped it with more than 60,000 new-home permits. Middle-of-the-road projections show the metropolitan population reaching 9 million by 2030. Such matters are of more than passing interest to Tom Buschatzke, the city’s water adviser, who occupies a workaday office in City Hall. A 1930s-era hand-colored map of the valley and its irrigation districts leans against the wall behind his desk. The Phoenix metropolitan area relies on a mix of water supplies — primarily from the Central Arizona Project, the Salt River Project, and groundwater. 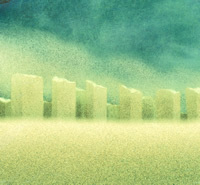 That, theoretically, gives the area greater flexibility to protect itself against drought. "In the short term, we’re probably in very good shape," says Buschatzke. One particularly hopeful sign is the fact that this winter’s rains have put a lot more water in the Salt River Project system. But the long-term outlook may not be so good. Recent studies, including one from the University of Arizona, indicate that droughts could be more frequent, more prolonged, more severe, and far more widespread than was believed even recently (HCN, 1/24/05: Written in the Rings). In the University of Arizona study, says Buschatzke, "One of the big things we tried to find out was the probability of simultaneous drought on the Salt and Verde rivers and the Colorado River. And the preliminary results are showing that the probability is greater than we originally thought." Buschatzke adds that Phoenix has traditionally planned for seven- or eight-year droughts, the longest that have occurred on the Salt River Project system in the past century. 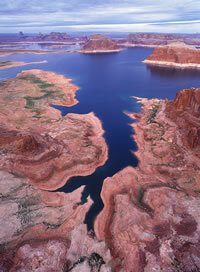 The University of Arizona study, he says, "is showing us that 20- to 30-year droughts can happen." If the drought becomes deep enough for the Interior Department to declare a shortage on the Colorado River, "excess" CAP water uses — whatever is being banked, or bought by the groundwater replenishment district — would be cut first. The next big cut would hit the irrigation districts that deliver water to more than 700 farms from Phoenix to Tucson. Once CAP was forced to reduce its deliveries by about 500,000 acre-feet — a third of the project’s total capacity — shortages would begin to cut into cities such as Phoenix. Even then, cities could potentially lease around 275,000 acre-feet of CAP water that Indian tribes received in a massive settlement with the federal government last year but are not yet using (HCN, 3/15/04: The New Water Czars). But as the tribes develop, they’ll have less water available to lease. And in a shortage, their share would be reduced along with the cities’, so it would be a little like looking to a leaking lifeboat for salvation. Cities could also begin drawing on water banked underground: The City of Phoenix has over 2 million acre-feet of recharged water that it can pump, enough for about six years’ worth of demand in the city. In a worst-case scenario, Arizona’s carefully guarded aquifers would prove their worth as Phoenix tapped into "native" groundwater. The trouble is that Phoenix would be just one of many users in a stampede on the state’s aquifers. For decades, the operative theory behind water management in Arizona was that the demand for water would remain relatively stable. Urban growth, the theory went, would literally take the place of farms by developing on top of former farmland. Initially, farmers would convert from groundwater to CAP water, thereby preserving — or at least taking the pressure off — groundwater supplies. Then, as the farms turned into houses, those houses would continue using CAP water. In reality, however, much of the new development has taken place on raw desert rather than former farmland. "We used to go from desert to farmland to houses," says Gammage. "Now, we go straight from desert to houses." Though the number of farms has declined somewhat, in 2002 — the most recent year for which data are available — agriculture was still responsible for more than 40 percent of the total water use in the Phoenix area. The earliest year that Interior Secretary Norton might be forced to declare a shortage is a matter of some debate. Arizona’s water agencies have said 2010 or 2011, but the Department of Interior has hinted that it could come as early as 2007. State and city water managers maintain that, if a shortage is declared, it could be 20 years before it affects cities. Nonetheless, many officials are preparing for the worst. Farmers would face cuts as soon as a shortage is declared, and they are already being forced to contemplate a wholesale return to groundwater. Farmers’ water rights are "grandfathered" in at levels based on their maximum water use from 1975-79, a time of historically high farm production in the state. And, thanks to years in which they pumped less groundwater than their grandfathered levels, farmers have accumulated a massive number of so-called "flex credits" — somewhere in the neighborhood of 10 million acre-feet — that they could use anytime they want. It is already clear, however, that returning to groundwater will be tremendously expensive. Grant Ward is the general manager of the Santa Cruz Water and Power Districts Association. The association represents two of the largest CAP irrigation districts, covering some 174,000 acres south of Phoenix, which primarily grow cotton and feed for nearby dairies. Ward says that each of the districts currently has about a quarter of the well capacity it would need to fully replace CAP water in a shortage. Moving closer to 100 percent would require getting as many as 300 older wells in each district back in working order. "These wells have been sitting here (unused) for years," he says. "Some will take a lot (of work)." The district would also need to drill new wells, which could cost $200,000 to $300,000 each. Running the pumps will be expensive, too, and it will get even more so in a drought, says Jim Holway, who recently left his assistant director’s position at the Arizona Department of Water Resources for a job at Arizona State University’s International Institute for Sustainability. "One of the reasons that agriculture can afford to pump groundwater very economically is because they have low-cost power," says Holway. "But a lot of that is hydropower. There’s a double whammy: The water they’ve been using, they don’t have, and the cheap energy to get the alternative source isn’t there either, because there’s no water to run through the dam." Farmers in the area have already seen their electricity prices go up by 10 percent per year over the past three years: Decreased power production from Glen Canyon and Hoover dams is forcing them to buy more power produced by natural gas-fired power plants, even as natural gas prices rise. Urban residents, too, could see massive rate hikes, as water departments are forced to drill more wells to make up for the lost water from the Colorado and other rivers. Says Holway: "Some of the cities are frantically" — he pauses, and then chooses a different word — "they’re actively doing studies to figure out how they get the right infrastructure in place to serve 100 percent groundwater." The good news is that there is apparently no shortage of groundwater available to tap: The Department of Water Resources estimates that there is at least 68.3 million acre-feet of water under the Phoenix area. The bad news is that getting to that water will be neither easy nor cheap. "Honestly, I’ll tell you this," says Tom Buschatzke: "We do not have the well capacity to meet (the city’s entire yearly demand)." The city, whose 29 operating wells currently give it only 15 percent of the well capacity it would need, is assessing what it will take to meet full demand. That could mean drilling as many as 190 new wells, just for the city of Phoenix itself — to say nothing of the surrounding metropolitan area. And, Buschatzke says, "the costs (of actually pumping it) would be astronomical." Like farmers, cities would face high power costs for pumping. The farther down groundwater is drawn, the more energy it takes to pump it, and the stampede will only make that worse. But that would be just part of the picture. Much of the state’s groundwater has been contaminated by chemicals such as fertilizers from overlying farmland, and treating it to drinking-water standards would be expensive as well. The city of Phoenix doesn’t have formal estimates for potential groundwater treatment costs, but it could be much more than the $500 per acre-foot it currently costs to treat CAP water. All of that cost would come straight back to water customers. For members of the groundwater replenishment district, who are currently drawing on groundwater but have committed to paying for replacement water, the cost is also going to get more expensive as supplies get tighter. Homeowners will probably pay $231 per acre-foot this year, but they won’t know how much they actually owe for replenishment water until the district sends them a bill for whatever water it was able to buy. "That’s a problem," says Cliff Neal. "We’re trying (to make sure) that when a homeowner moves into a (groundwater replenishment district) plan, they understand their costs for replenishment could be pretty high in the future. The developer has to declare that they are members of the district, (but) you’ve got a ton of papers to sign as a new home buyer, and you don’t read everything that’s in front of you." Neal says the district estimates that the average cost of replenishment water will be around $500 per acre-foot in 2025, but drought and increasing competition for water could send that cost even higher. Added together, the price of drought could be staggering in a state that is already $1.65 billion in debt for the CAP over the next 40 years. This winter’s storms may postpone the possibility of shortage for one more year, but an accurate outlook won’t be available until April. And even though this drought will eventually end, another one will never be far off. No matter how good the weather, Arizona will always be the first state on the river to lose its water. All this has left the CAP’s Sid Wilson thinking wistfully of a grandiose piece of the Central Arizona Project deal that never came to be. "(Arizona’s low priority) was a political deal. That was the price of getting CAP," he says. "But at the time we got it, there was also a federal promise to augment the flows of the river by 2.5 million acre-feet." "Augmenting" is shorthand for what likely would have been the biggest water-development project the U.S. had ever seen: It would have taken water from the Columbia River in the Pacific Northwest and pumped it halfway across the West to add to the Colorado River. It was, quite literally, a pipe dream, yet it hasn’t been forgotten in the offices of the Central Arizona Project. Wilson holds onto it like a wild card, hoping that it will at least give his state a better position at the bargaining table as the Colorado River Basin states scramble for a collective solution: "What we’re saying is, ‘We had to accept a junior priority, but we also had a promise of augmentation, and that never happened.’ "
Talks between representatives of the seven states continue in an effort to come up with a shortage-sharing plan to deliver to the secretary of the Interior by April. Now, to keep the CAP domino-effect from reaching the cities, Arizona may seek a kind of post-Cold War détente and ask the other states to help share the pain. "In terms of planning shortages," says Wilson, Arizona could propose that some of its farmers take less water as a way to keep more water in Lakes Mead and Powell and delay triggering an official shortage. "But in return, (we’d like to figure) out a way to proportionalize the cut when the shortages get deep and go into our (urban) uses. We’d like to see some sharing of impacts with California and Nevada." The drought has done more than anything else to make water managers realize that it’s impossible to ever engineer an escape from the hydrologic cycle. Every new house is an added liability in the next drought, and Arizona’s phenomenal growth raises the stakes with each passing year. Sitting at a polished conference-room table in his office high above downtown, Grady Gammage, the attorney, has begun to see the limits: "Arizona has always felt insecure about its image as a place that was so dry, people couldn’t live here." In response, he says, water managers have made heroic efforts to ensure that there was always enough water for the boom to continue. "I was resoundingly hooted down as a nut. But 7 million people is twice what we have now, and at least then we wouldn’t be living totally on the ragged edge of what we can sustain here." "Phoenix is a place, like much of the West, that has been built on population growth as the goal. All of our tax structures, all of our infrastructure, everything … our identity is wrapped up in being first, second or third," he says. "If Atlanta" — the top new-home market in the nation — "is ahead of us, we’re pissed off. If Las Vegas beats us in something, we’re worried. "And I think it’s time we got over that." Matt Jenkins is HCN associate editor.